The diagnostic relevance of the blood film cannot be underestimated in the assessment of children with suspected primary or secondary haematological conditions. The blood film not only serves as a diagnostic tool but also allows for screening, monitoring of disease progression and therapeutic response in children with a variety of haematological conditions. This article outlines the appearance of normal paediatric and neonatal blood films. The technical aspects involved in preparing a blood film are discussed. Consideration is given to the indications for preparing a blood film and some of the limitations of blood films. Finally, attempts are made to highlight the role of the blood film in the diagnosis of some common paediatric and neonatal conditions. The blood film is the preparation of blood on a slide for microscopic analysis of peripheral blood cells. The development of automated blood cell analysers has led to a reduction in the number of blood samples requiring a blood film. However, the diagnostic relevance of the blood film cannot be underestimated in the assessment of children with suspected primary or secondary haematological conditions. The blood film not only serves as a diagnostic tool but also allows for screening, monitoring of disease progression and therapeutic response in children with a variety of haematological conditions including leukaemia, haemolytic uraemic syndrome and bone marrow failure syndromes such as Fanconi anaemia.1 We believe it is important for paediatricians to have an understanding of blood film interpretation in order to correctly apply results to their clinical practice. This paper highlights the indications for preparing a blood film and an overview of the possible findings. White blood cells can be divided into the myeloid/monocytic cells (neutrophils, eosinophils, basophils and monocytes) and lymphocytes. Segmented neutrophils are the predominant white cells in the peripheral blood. The total white cell count and the neutrophil, monocyte and lymphocyte counts are often much higher in the neonate than the older child.5 In addition, it is important to remember that the automated lymphocyte count may be falsely elevated due to the presence of nucleated red blood cells. A venous or capillary blood sample should be mixed with a suitable anticoagulant such as EDTA in a sample bottle and transported to the lab without undue delay. It is very helpful to the laboratory staff to include clinical information on the request form. The blood film is prepared by skilled laboratory staff or by an automated blood film machine. The sample should be well mixed. A small drop of blood is dropped onto a clean glass slide. A smear is then made across the slide using the wedge technique.6 The slide is then stained before examination. Most laboratories use a variant of the Romanosky stain.7 A completed blood film is shown in figure 1. 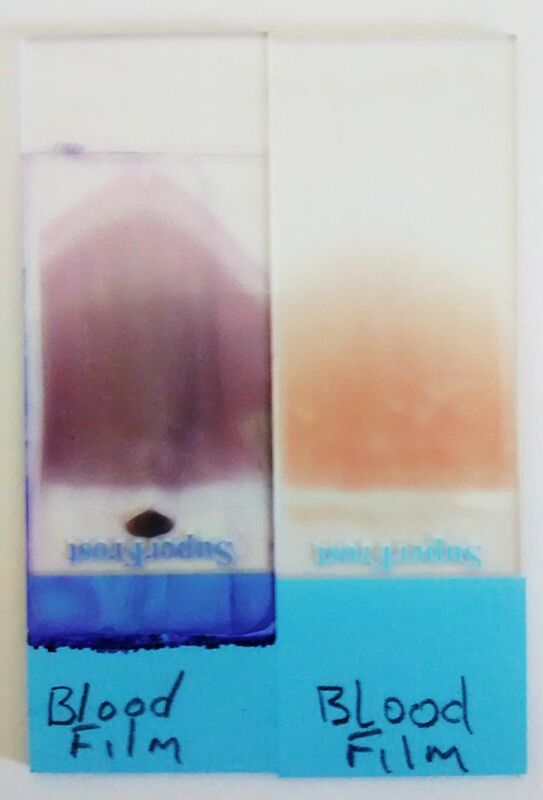 Example of both a stained and unstained blood film. The blood film should then be examined by microscopy with a systematic approach by staff trained in haematology morphology. The morphology of the blood cells on a blood film is best assessed by looking at the three cell groups—red cells, white cells and platelets. The size, shape, colour of the red cells and the presence of red cell inclusions should be assessed. White cell morphology should be assessed and a differential white cell count performed. Platelet count and size should be reviewed for any abnormalities. In addition, the blood film may also reveal other abnormal cells, for example, leukaemic blast cells. Infections which may be evident from blood film analysis include malaria, borrelia, filarial and candida albicans. It is essential that the blood film is always interpreted alongside the patient’s clinical details. There are two main reasons why a blood film may be created. There are some limitations associated with blood films. Delays in transporting samples to the laboratory and exposure to extremes of temperature can cause artefactual changes. Clotted samples cannot be accurately used and often need to be repeated. Poor technique leads to the creation of poor quality slides which can be difficult to interpret. This section uses four clinical questions to discuss the use of blood films in common and important paediatric conditions. Can iron deficiency anaemia be diagnosed from a blood film? The presence of hypochromic, microcytic red cells most often suggests iron deficiency anaemia (IDA) (figure 2). However, this picture may also be present in patients with thalassaemia. It is essential to differentiate between these conditions to avoid inappropriate iron therapy in patients with thalassaemia. Standard tests to differentiate between IDA and thalassaemia include iron studies, haemoglobin electrophoresis and molecular testing for haemoglobin variants. Blood film showing hypochromic, microcytic red cells. Does a normal blood film exclude leukaemia? Leukaemia is the most common childhood malignancy accounting for approximately 30% of cases. Clinical presentation can be highly variable depending on the child’s age and the extent of leukaemic infiltration of the bone marrow and other sites. 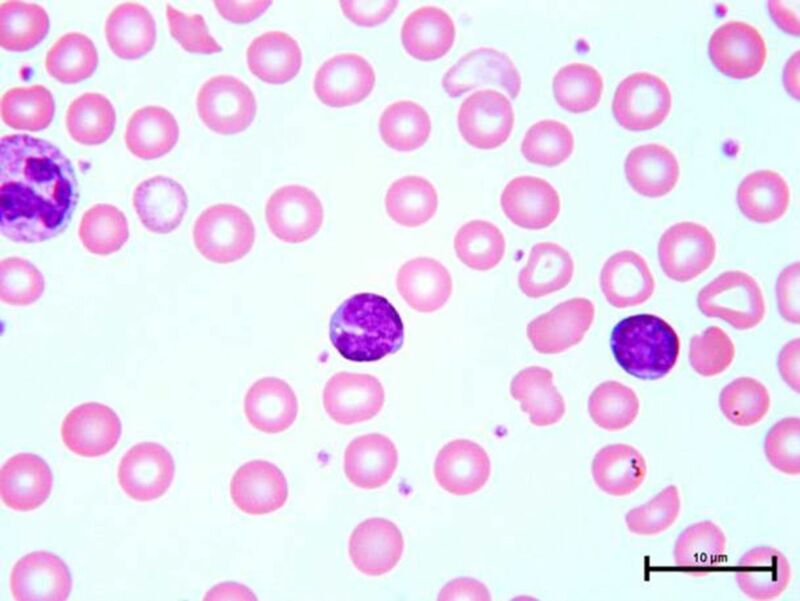 A British Medical Journal review on the diagnosis and management of acute leukaemia in children cited the full blood picture and blood film as the most useful initial investigations when there is a clinical suspicion of leukaemia.10 The full blood picture will often reveal pancytopenia due to bone marrow infiltration. Blast cells may elevate the white cell count despite neutropaenia. The presence of blast cells in the blood film is highly indicative of leukaemia. (figure 3) Blast cells are immature cells with open nuclear chromatin. They vary in size from the size of small mature lymphocytes to large cells. Many have a high nucleus:cytoplasmic ratio. The nuclei may be irregular in shape. Other features may include Auer rods and cytoplasmic granulation or vacuolisation. They are best visualised at the lateral edges of the film. Blood film showing blast cells in patient with leukaemia. Does a normal blood film in a newborn with trisomy 21 exclude clinically significant transient abnormal myelopoeisis (TAM)? As TAM is a disorder of haemopoeisis, the blood film of affected patients will be abnormal. 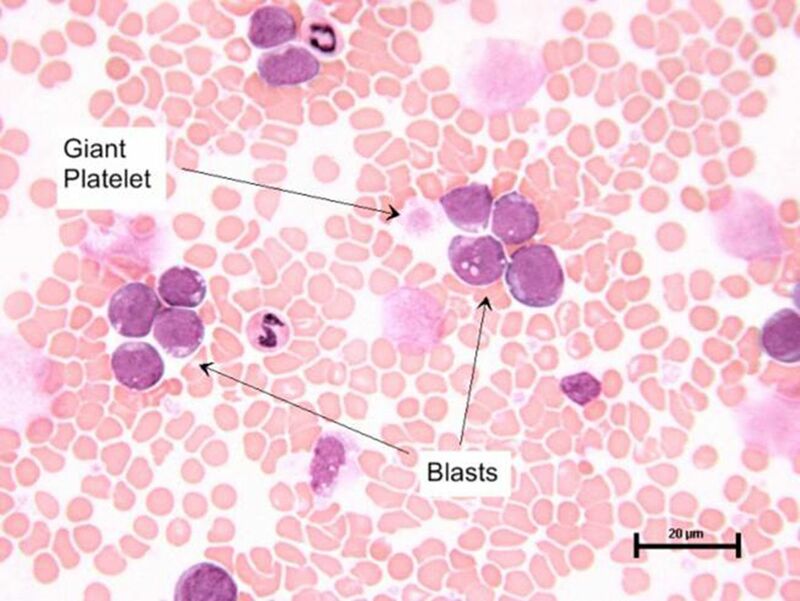 Common findings include elevated numbers of circulating, immature myeloid cells, including basophilic blasts, nucleated red cells, megakaryocyte fragments and thrombocytosis or thrombocytopaenia12 (figure 4). However, it is not uncommon for the blood film to be abnormal in neonates with trisomy 21. A recent prospective analysis of 200 neonates with trisomy 21 showed that 195 of these neonates (97.5%) had circulating blasts.11 In the majority of neonates, TAM will resolve spontaneously without any intervention. Those with severe symptoms may require treatment with low-dose cytarabine chemotherapy. Approximately, 20% will progress to develop acute megakaryoblastic leukaemia before 4 years of age. Blood film showing blast cells in neonate with transient abnormal myelopoeisis. Is a blood film of use when a diagnosis of pertussis is suspected? Pertussis is an acute bacterial infection caused by Bordetella pertussis. Studies have shown that up to 50% of children with pertussis have an absolute lymphocytosis. Pertussis lymphocytosis is caused by pertussis toxin released by B. pertussis but the exact mechanisms by which this occurs remain unclear.13 On morphological examination of the mature lymphocytes, they appear small with hyperchromatic, cleaved nuclei (figure 5).14 Therefore, the blood film may prove a useful diagnostic aid in patients with unexplained lymphocytosis. 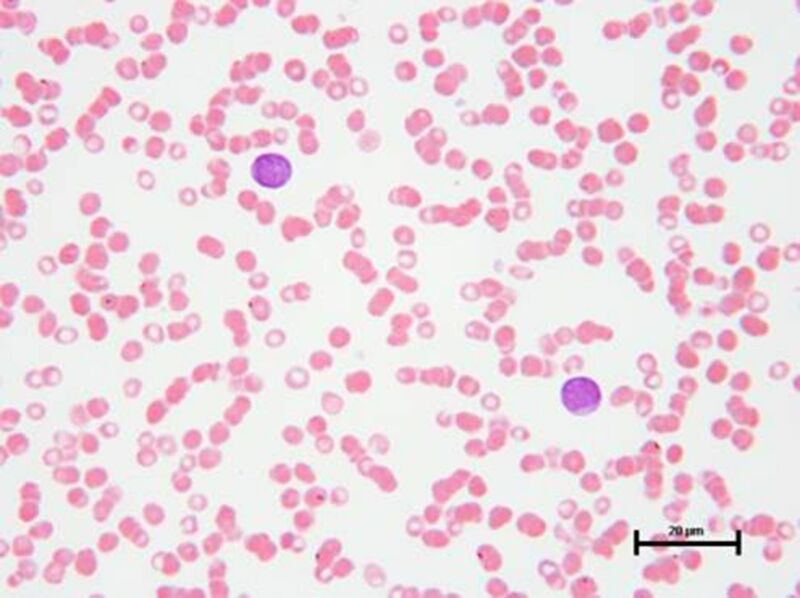 Blood film showing small lymphocytes with hyperchromatic, cleaved nuclei. The blood film is a quick and important investigative tool. An understanding of the appearance of a normal paediatric and neonatal blood film is crucial to accurate interpretation. 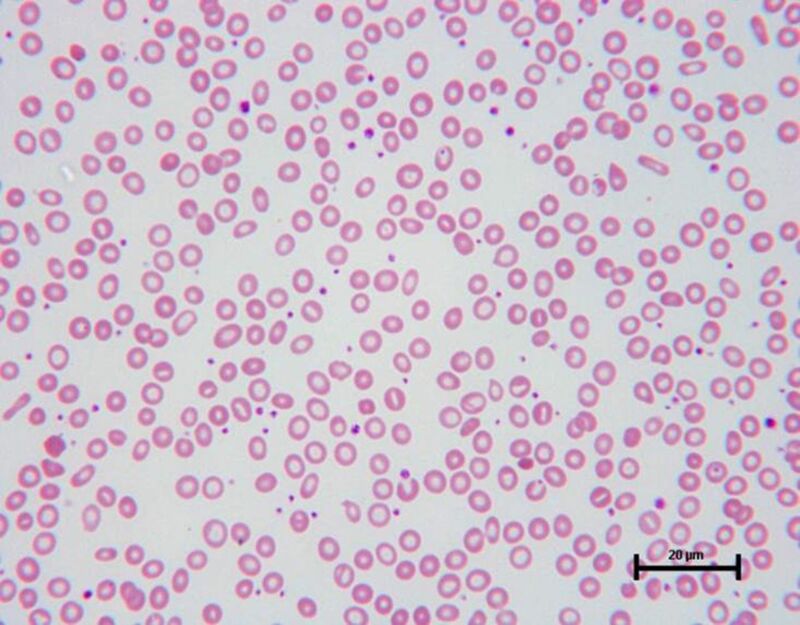 The blood film has a role in both the diagnosis and monitoring of a number of paediatric haematological conditions. A systematic approach to examination of the blood film is essential. It is always important to interpret the result in correlation with the clinical picture. Although hypochromic microcytic anaemia often represents iron deficiency anaemia in children, careful analysis of all red cell values reported on the complete blood count and examination of the blood film will help to distinguish between iron deficiency anaemia and thalassaemia. The presence of blast cells in the blood film is highly indicative of leukaemia. However, a normal full blood picture and blood film does not exclude leukaemia. The blood film of neonate with trisomy 21 and clinical signs of transient abnormal myelopoeisis will be abnormal and may display elevated numbers of circulating, immature myeloid cells, including basophilic blasts, nucleated red cells, megakaryocyte fragments and thrombocytosis or thrombocytopaenia. Characteristic changes in lymphocytes on the blood films in patients with a lymphocytosis may help with diagnosing Bordetella pertussis. BMcN would like to thank the RBHSC Medical Staffing Committee for funding his clinical fellowship.
. Peripheral blood film – a review. Ann Ib Postgrad Med 2014;12:71–9.
. Atlas of paediatric peripheral blood smears. 1st edn: Abbott Laboratories, 2008.
. Dacie and Lewis practical haematology: Elsevier Health Sciences, 2016.
. Blood cells: a practical guide: John Wiley & Sons, 2015.
. Wintrobe atlas of clinical haematology: Lippincott Williams & Wilkins, 2007.
. Discriminant functions in distinguishing beta-thalassemia trait and iron deficiency anemia: the value of the RDW-SD. Internet J Hematol 2011;7:1–13.